We all have different ways we’d describe our relationship with our hair. Some may find it pleasant and hassle-free, others turbulent. Me? I’d describe it as accepting, forgiving and embracing. Many of you know my hair story. After relaxing, braiding, weaving for most of my life, I only went back to natural almost 5 years ago. I chopped off all my hair when I realised that the relationship I had with my hair had turned toxic. I was addicted to straight hair, and by any means necessary, I would achieve that. Scalps burns, empty wallet and eventually hair loss. Thing is, by the time I realised how detrimental my relationship with my hair had gotten, it was too late and caused a lot of damage. The last time I relaxed my hair, I forced the hairdressers to do it after removing braids earlier that day. I refused to leave the salon without my straight hair. That was the last day relaxer touched my hair. I know a bad hair relationship all too well. So by virtue of my experience, I was determined to make my relationship with my new natural hair a good one. Oh yeah, we’ve had our ups and downs. Just like with any good relationship, you need to work at it and at times you wonder where things are going. But it’s really important to evaluate where you are, what the goal is and what are you bringing to the table to make it work? I’ve previously described my hair as defiant, stubborn, hard. I can honestly say now it’s at a more positive place where I know if I don’t put in that time and effort into caring for it and listening to it, I wouldn’t love it as much as I do. I love my natural hair because it’s the most me than any other hair I’ve rocked. Fro has a personality of its own. It represents my heritage and is so versatile I sometimes can’t keep up. I’m constantly surprised at what it can do. Dove believes in having a long term positive relationship with your hair. The relaunch of their hair care line Nutritive Solutions promises to deliver progressive nourishment so your hair’s health and appearance will improve the more you use it. For more info on their brand new line, check out my blog post here and watch my review here. Just a spoiler alert: I really enjoyed using their Intensive Repair line on Fro. My absolute favourite is the mask. And yes ladies, you can totally use this line on your kinks! Want to get your hands on these goodies? 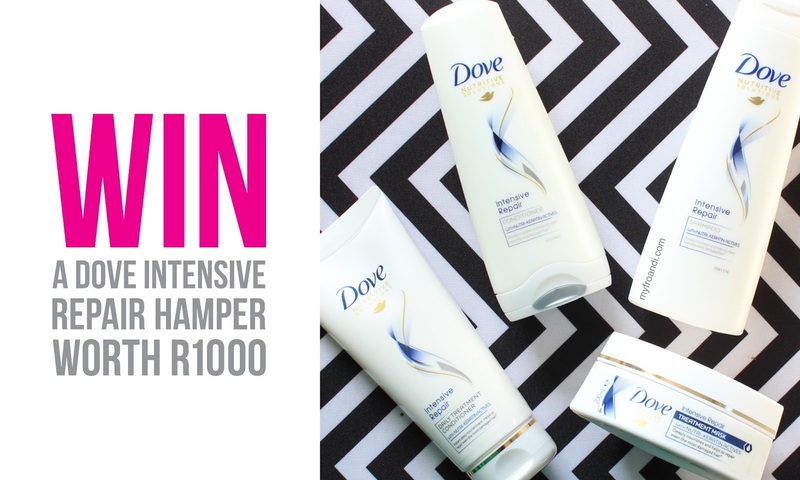 Dove would like to treat 5 lucky My Fro & I readers to a Nutritive Solutions Intensive Repair hamper worth R1000. Dove Intensive Repair Shampoo, Dove Intensive Repair Conditioner, Dove Intensive Repair Daily Treatment Conditioner, Dove Intensive Repair Treatment Mask, 1 x microfibre towel, 1 x bath towel. In a couple of sentences, share what your hair story is in the comments box below. How are you currently wearing your hair? What do you like or dislike about it? What would you change or never change about it? How are you hoping the new Dove line will help you? The best answers will win. The competition will close at 4pm on Friday 25th March, 2016. Five (5) winners will be chosen and announced by Friday 25th March, 2016. The winner will be contacted via e-mail so please supply your address in comment and will need to supply full contact and delivery details. If a winner does not respond to the email within a week of contact, another winner will be chosen. All prize delivery logistics will be handled by Dove’s representative. I stopped relaxing my hair in 2001. Although I have cut my hair 3 or 4 times (if not more) since then I have always kept it natural. I started getting really serious about maintaing my natural hair in 2014 when I discovered this blog and other natural hair blogs. It has been an interesting journey and I have fallen in love with my hair all over again. At the moment I have braids in my hair and I am concerned about the dandruff and dryness of my hair even though I am trying to keep it moisturized. I am also concerned about my hair line, one of the perils of braids in my opinion and the spilt ends I have been seeing. I love the way my hair grows so fast and its fullness (I have a lot of hair)and I dont think I will ever relax my hair again – I love it natural. I hope the new Dove line will help moisturize and repair my hair and give it a new freshness. I first big chopped in 2012 and after just a month went back to the creamy crack due to a lack of knowledge and I hate I admit laziness. I stopped relaxing my hair 29th Dec 2015 and big chopped two weeks ago. I won't lie it is extremely difficult to find myself "attractive" again since the big chop, not because of the texture of my hair but it's length. We've been "conditioned" to beleive that only long flowy hair is acceptable and beautiful and if its short it definitely shouldn't have kinks. I'm learning to take care of little fro as best as I can and I'm hoping The Dove Intensive Repair range will help condition and repair my always thirsty and frizzy hair. As challenging as it has been I would not change a single thing about her. I love waking up and dressing bolder and being more self assured in myself. It's hard to beleive that a hair cut could bring about all this change but I think I lot of women, not just black women will agree that it's not just hair. I went natural anout 4 years ago. The first year was a disaster, I had no hairline, hair was thin and falling off I had to cut off all my hair(the bit I had left) I then realised that I didnt know what I was doing and started researching and asking other naturals for hair tips. Now, my relationship with my hair is much better, I know how to handle it and what it needs most times. I absolutely love my hair now, I love that it has it's own personality, I can never tell what shape or form it'll after undoing my bantu knots. What I would like to experince more often is keeping my hair moisturired at all times, it tends to get dry very quickly and starts breaking. I remember one time when I was about 6 or 7 where I cried to my mom about ho ugly my hair was because it was not straight long and flowy. I guess that mentality stayed and grew with me and was the reason why i was a closet natural for two years of my natural hair journey. I recently came out after having an honest conversation with myself when i realised that my 'closet tendencies' were not only hurting my hair because i would neglect it under the weaves but it was just wrong that i did not love my hair enough to wear it as it is and deem it worth the detangling, the shrinkage, the hours of styling and the data bundles and money spent on learning how to properly take care of it. Heck I even considered seeing a shrink. but now, as i spend more time getting to know it and nourish it, I'm falling in love with it. Naps and all. I’m currently four years into my relaxed hair journey(I went natural for about 4 years in varsity) and as processed hair would have it, it needs that extra bit of care as it is not as strong as natural hair. It breaks when I don't give it proper attention and care and split ends are horrendous. I’ve subscribed to a couple of relaxed hair bloggers’/ Youtubers’ channels in the hopes of learning more about maintaining healthy relaxed hair and so far I’ve enjoyed taking care of my relaxed hair with the knowledge that I’ve gained. I still have protective styles done every now and then for a different look, but the absolute pleasure comes from having my own hair looking and feeling healthy. My #Hairgoals is to grow my hair past my shoulder blades and have it thicker and although I've been tempted to dye it, I noticed that I love my natural brown-black colour and would never change it. I'm particularly interested in seeing how the Dove Intensive Repair Treatment Mask can revitalise the appearance of my hair and whether it can improve the texture of my frizzy dry ends. I remember being on YouTube watching the ladies from the "My Natural Sisters" hair channel, I was blown away that natural hair could grow to such lengths… let alone be curly (#shamefully ignorant). They mentioned so many foreign concepts, well at least foreign to me, such as 'bagging', 'twist-outs' and 'product junkie'. All of this tickled my fancy and I felt challenged to try something new as well as the fact that I was tired of constant scalp burns from hours in the salon enduring the harsh chemicals of a relaxer. And on the 19th of January 2015 I said bye-bye to a life of creamy crack and decided to big chop! It took me a while to get accustomed to the change but with time my resolve has grown and so has my fro. I am currently wearing my hair in its stretched out state which is easier for me cause I don't have to do too much styling in the mornings. I would never give up the voluminousness of my hair, its thickness is one of the things I absolutely love about it. It kind of reminds me of a big puff of sheep's wool lol. One thing which I dislike about my hair would have to be the fact that it gets super dry which causes a lot of breakage especially on my ends. I am hoping that the Dove Intensive Repair line can help combat some of my hair's dryness and restore it to a healthier state. I grew up surrounded by my straight-haired cousins, believing that my hair was "unmanageable", "not nice" and "nappy"… Fast forward 30 years later, and I've learned to embrace it with all it's kinks, curls and frustrations. I'm on my second round of embracing the fro – and confess it's a bit harder some times than at others… but determined to embrace it no matter what. Onto Dove : since returning to SA, finding products that work with my hair has become more challenging… I love the fact that mainstream stores and brands are recognising and encouraging products that speak to our hair type – I hope it takes into account the dryness that comes as standard for curly haired sisters, and I'm sincerely hoping it helps my hair feel softer – as I tend to have a very dry strand. …..And thanks for the great blog – hope the baby bump is progressing well! Hi Celeste! Congratulations, you're a winner of the Dove hamper. Please send an email to myfroandi@gmail.com with your details. Thanks! I started my natural hair journey in 2013 and I relaxed it because I didn't have all the info I have now. In June 2014 that was my last relaxer but because of lack of knowledge my hair was breaking. Now I am rocking a TWA and I am so loving my hair. I hope that the products can help with breakeage and keep my afro strong and healthy. I started my natural hair journey in 2012 when i cut off my hair after a long battle with my relaxed hair. 6 months in i found myself stuck and not knowing how to take care of it so i decided to relax it again this led to the same cycle.. i last chopped off my hair september 2014 and by early 2015 i decided to buy products that would help me take care of my hair.. although my fro and i have bad days (shrinkage and all) i wouldn't change anything about it. I like to wear protective styles a lot, but when fro is out i like to wear it all free or in a fro-hawk kinda situation. so far i love being natural!! Hi! I've been natural for the last two years and three months and I'm completely loving the journey. I went natural in Jan 2014 after experiencing a major hair setback when I took down mini twists that I had installed by some Masai men. The journey to recovery was hard but after transitioning from August 2013 till early January 2014 I decided to leap and start the year off with a bam. I've never had any regrets. I love my natural hair for it's versatility and the only thing I don't like about it is how dry it gets. So the Dove intensive care would be perfect for me! Right now my hair is in a protective style (vixen weave) which i love because it's tucked away from the elements and I can still wash and moisturize it. I wouldn't change a thing about my hair. P.s I love your blog! Actually got inspired and modelled mine after it. I had natural hair for a year in earlier grades of high school but ended up relaxing it because I got bullied because of it. After I relaxed it, I never went back to natural hair until i decided to transition to natural earlier this year in matric… If I get bullied again, it won't affect me as much aince I'm much older now. I had dreadlocks for just over 2 years and i got tired of them. After seeing that there are so many ways i could wear my natural hair i made the decision to chop them off.In December of 2015 i decided the time had come and have began my twa journey. I am really loving it so far. I currently braid my hair so it can grow quicker before i start leaving it out.I have been doing a lot of cornrows since my chop. The one thing i am liking about my short natural hair is that it is easy to maintain,so if i don't have braids i can just wake up in the morning, wash it and off i go. After reading about the dove products and because its recommended by Aisha i have a strong feeling it will really benefit my hair as I'm looking to have strong natural and healthy looking hair.